This is a Chinese name; the family name is Chung. Arthur Chung (January 10, 1918 – June 23, 2008) was the first President of Guyana from 1970 to 1980. He was the first ethnic Chinese (Hakka) head of state in a non-Asian country. During his time as President of Guyana, the office was that of a ceremonial head of state, with real power in the hands of Prime Minister Forbes Burnham. He was honoured with Guyana's highest national honour, the Order of Excellence (O.E.). Chung was born into Chinese Guyanese family at Windsor Forest, West Coast Demerara in British Guiana; he was the youngest of Joseph and Lucy Chung's eight children. He was educated at Windsor Forest, Blankenburg and Modern High School. In 1954, Chung married another native of Windsor Forest, Doreen Pamela Ng-See-Quan, with whom he had one daughter and one son. Before civic service, Chung was an apprentice surveyor and sworn land surveyor. In the early 1940s, Chung entered the Middle Temple of London, England and qualified as a barrister in 1947. He returned to Guyana and was later appointed an acting magistrate. He became a magistrate in 1954 and a senior magistrate in 1960. Chung also served as Registrar of Deeds and of the Supreme Court. He then became a puisne judge and finally an Appeal Court Judge in 1963. 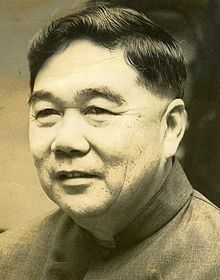 When Guyana became a republic under the leadership of Forbes Burnham in 1970, the National Assembly elected Chung as the country's first President; he took office on March 17, 1970. Ten years later, a constitutional revision transformed the presidency into an executive position, and Burnham succeeded Chung as President on October 6, 1980. Chung died on June 23, 2008 at his home. In the two months prior to his death he had been hospitalized a number of times, and he was last released from the hospital on June 20. ^ a b c d e "Guyana’s first President dies" Archived February 14, 2009, at the Wayback Machine, GINA, June 23, 2008. ^ a b "Guyana’s first president Arthur Chung dies", Starbroek News, June 24, 2008. This page was last edited on 20 March 2019, at 04:05 (UTC).